Cats are amazing creatures, unique and interesting in almost every way imaginable. Unlike canines, cats are obligate carnivores and their systems have evolved from thousands of years of eating a raw food diet in the wild. In their natural habitat, cats consume prey high in protein with moderate amounts of fat and minimal amounts of carbohydrate. The natural diet of cats in the wild is a meat based regimen eg, rodents and birds that contain little carbohydrate therefore cats are metabolically adapted to preferentially use protein and fat as energy sources. Cats do need a little vegetable matter – approximately 15% of their total diet. From time to time, and as the mood takes them, they may nibble on herbs, grasses and even flowers. Cats’ digestive systems are finely tuned to handle things humans can’t. Their stomachs have a highly acidic environment, which is an excellent deterrent to ingested bacteria and therefore they are ideally adapted to eat raw meat. You might worry about salmonella. Of course salmonella is out there, but as with meat you would prepare for yourself, following safe handling practices minimizes the risk. Cats are very resistant to bacteria such as salmonella, which makes sense for an animal that evolved to exclusively eat raw meat. Cats have a very short digestive tract and on average it takes 6 to 8 hours for them to digest a meal. This doesn’t give bacteria enough time to proliferate and make the cat unwell. Compare that to humans, where food takes 36-48 hours to pass through, so we are much more susceptible to bacterial pathogens. Parasites are killed by freezing the food. Because our feline friends are obligate carnivores i.e. strict meat eaters, they have less ability to digest grain and high levels of vegetable matter. Cats have very low thirst drives and are designed to obtain the majority of their water intake from their food. They did, after all, originate in desert environments. For this reason, cats thrive on diets which have high water content such as raw food. 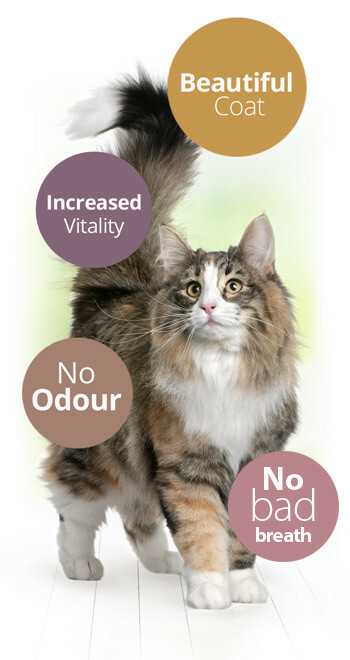 In contrast, cats exclusively fed water depleted dry diets produce less volume of higher concentrated urine and may become susceptible to urinary tract problems. “Nature knows best”, is one of those trite sayings, but – when one stops to think about it – the phrase contains a great truth. In the wild, providing they have a choice, all animals eat what is best for them. For cats this means small prey or, if hunting with others, a share of larger prey. They are thrifty, too. Nothing is wasted, and that includes the bones. Initially these are ripped, torn, chewed and sucked to remove all the meat and marrow. So why have pet food companies invested so much money and effort over the last 150 years creating processed and dry foods? Pet food is big business. In the UK alone dog and cat food is worth something like £2 billion in sales a year. It isn’t just the overall size of the market that makes it so attractive to manufacturers, either. Processed pet food is incredibly profitable. The argument goes that cats can’t eat bones because they will choke. Also, there is supposed to be a risk that the bones will splinter and cause some dreadful internal injury. This is not born out by fact, of course. In the wild, wolves (so closely related to dogs that they can interbreed) have been eating bones for millions of years. Bones provide about a third of a dog’s nutritional needs. The only bones that are risky are cooked bones or bones from very old animals – both of which can splinter. What holds true for dogs also applies to cats. Remember before processed food existed, owners fed their cats raw meat, bones and leftovers. Over the course of a century and a half manufacturers have persuaded us all that there was a better and more convenient option. protein containing essential amino acids, including lysine. fat-soluble vitamins (A, D and E). The effects of raw feeding can have many benefits such as happier and healthier living pets. In conclusion… It is perfectly natural and safe for cats to eat raw meat, bone and organs as they would with their prey. They have been doing it for millions of years, after all.